There seemed to be a lot of interested and excited people at the show, and many of the companies i talked to were pleased with the turnout. Business software companies were generally visited by people interested in business software, which made them happy. The games, graphics and music people were visited by almost everybody, which meant there was alway a bit of noise and that sometimes made it difficult to sell things like accounting software in neighboring booths. …Andy Hertzfeld is smiling and chagrined. He really believed in the 128K mMacintosh, he says. He worked as hard as possible to make things small, to make them fit, to make a machine that could run well with only 128K. “And of all the applications for Macintosh,” he says, “the two I did — ThunderScan and Switcher — are the two biggest memory hogs there are1” He shakes his head at the irony. Apple pushed new accounting packages (Insight Accounting Series from Layered, Mac Onewrite from Sierra On-Line (!)) as evidence of the platform’s strength in the business market. The Macintosh, inherently, and the accounting software being written for it, break down the barier that prevents small businesses from buying accountin packages because [they are] too hard. Boston Software Publishers intro’d MacIndex, which extended MacWrite to offer subject indexing. It shipped with a DA called Keywords to allow users to mark terms for indexing while in MacWrite. 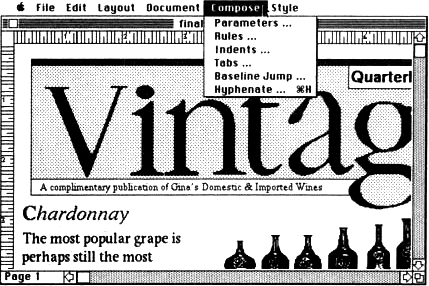 A fascinating glimpse into what could have been an alternate history of the entire Desktop Publishing market: Microsoft showed off Typographer, a “professional document design and composition system” which it had licensed from creator Broca Software. InfoWorld considered the program so significant it featured a screenshot as the only visual accompanying their coverage of the Expo. So what happened? Turns out the program was so buggy that beta testers rebelled, user groups turned up their noses, and Microsoft canceled the entire project. A follow-up article in InfoWorld was titled “Flawed Typographer”, and complained that “The preview copy had enough bugs to keep us from doing much of anything with it; Microsoft has a lot of work left to do before releasing the product — even the program’s name was misspelled on the disk.” An ironic twist to be sure, in a program named Typographer, but there were other problems more serious — users had to switch into and out of layout mode, and screen refresh problems prevented font changes from taking effect. In comparison to other desktop publishing programs, Typographer was difficult to use. I don’t know who came up with the user interface for this program, but they didn’t do their homework. By November, three months after the program’s preview at Macworld, Microsoft had announced the software would never ship: it failed to meet their “standards for quality and performance.” Broca, the original developers, said for their part that Typographer “got lost in the middle of a shutdown of Microsoft’s Mac Library publishing effort.” A possible arrangement with T/Maker as publisher apparently never came to fruition, and for all intents and purposes this software has been lost to time. So much for Broca Software. But what of Microsoft itself? By 1986 the company was “admitting it has missed its opportunity to produce independent desktop publishing programs,” according to an article in InfoWorld. Who knows how the competitive landscape might have looked for Aldus PageMaker and Quark XPress if Typographer had been a hit? 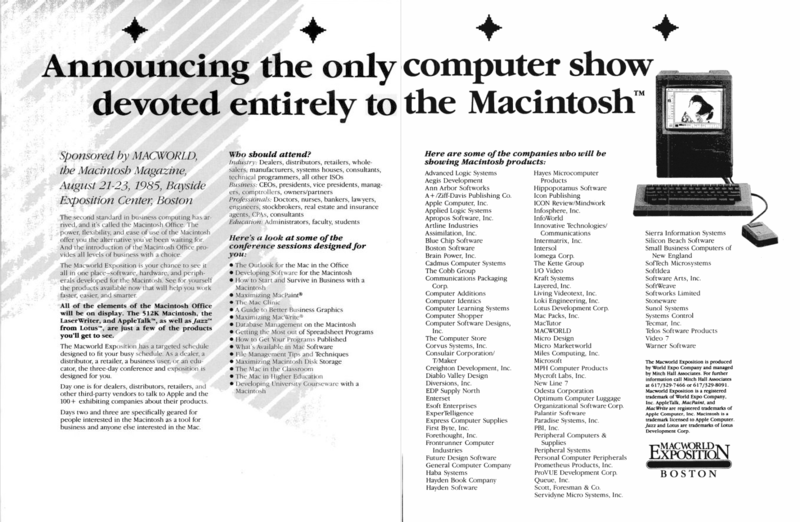 Speaking of forgotten software, Boston Software Publishers (mentioned above) also showed off MacPublisher II, which should probably be filed into the category “DTP programs which shipped before Aldus PageMaker.” Interestingly enough, Wikipedia claims MacPublisher was the first DTP program for the Mac. The whole article there is worth a read — it’s well-sourced and includes tidbits such as MacPublisher being the first to support color printing on the ImageWriter II. Early macro program MacTracks made its debut for $30 from publisher Assimilation Inc, which also introduced a $40 print spooler called Work ‘n Print. General Computer brought out the new Hyperdrive 20 for $2,800 — upgrade for only $900! Other expansion products included Beck-Teck’s clip-on Macmegabytes 1MB RAM board, available for both the 128 and 512. NEC Colormate was a hardware/software combo to allow eight-color printing on the NEC Color Pinwriter dot-matrix printer. Numeric Turbo… er, that is, NUMERIC TURBO.